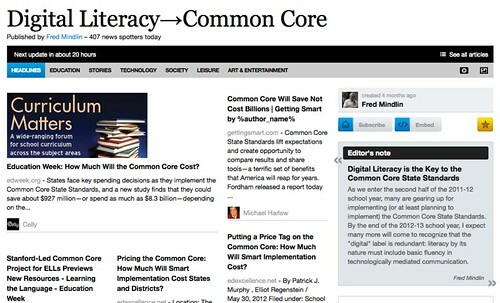 My National Writing Project friend, Fred Mindlin (@fmindlin), is the “curator” of a daily news feed that features lots of great links and articles and resources about the Common Core, but his lens is digital literacy. He uses the paper.li site (which I also use for my National Writing Project daily news), and it automatically gathers up information about the Common Core that is in his group of Twitter friends and hashtag topics. This entry was posted in Common Core, nwp. Bookmark the permalink.